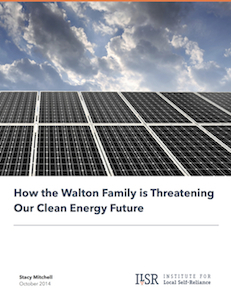 The Walton family — majority owners of Walmart — are impeding America’s transition to a clean energy future, a new study by ILSR finds. At a time when more than 500,000 households and businesses are generating their own solar electricity, and the U.S. solar industry is employing 143,000 people, the Waltons are funding nearly two dozen organizations working to roll back renewable energy policies, while a Walton-owned company is pushing for regulations aimed at hindering the growth of rooftop solar power. Rooftop solar — which is spreading rapidly thanks to favorable economics and strong state policies — offers a tremendous opportunity to accelerate the transition to renewable power, save money for households, and create tens of thousands of new jobs. Because it’s revolutionizing who owns and profits from electricity generation, rooftop solar is seen as threat by many utilities and fossil fuel companies. 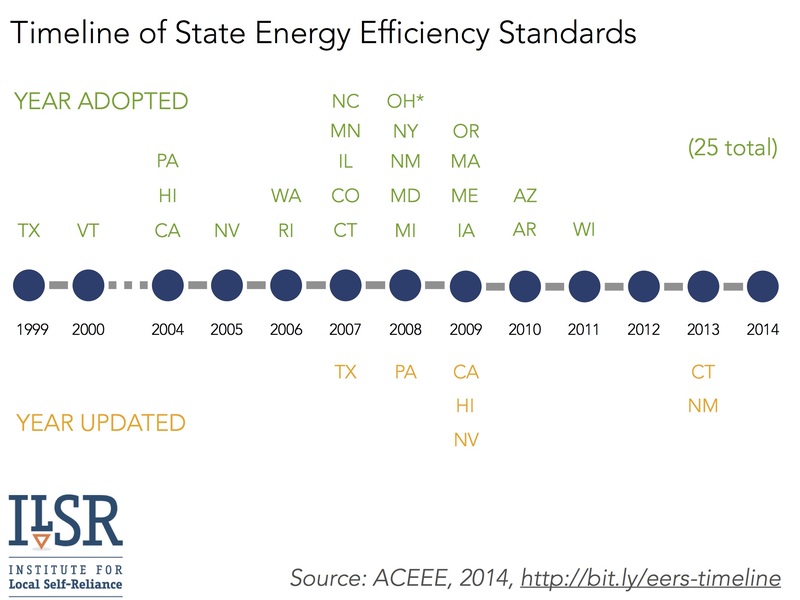 They are now campaigning in multiple states to weaken policies that enable rooftop solar. 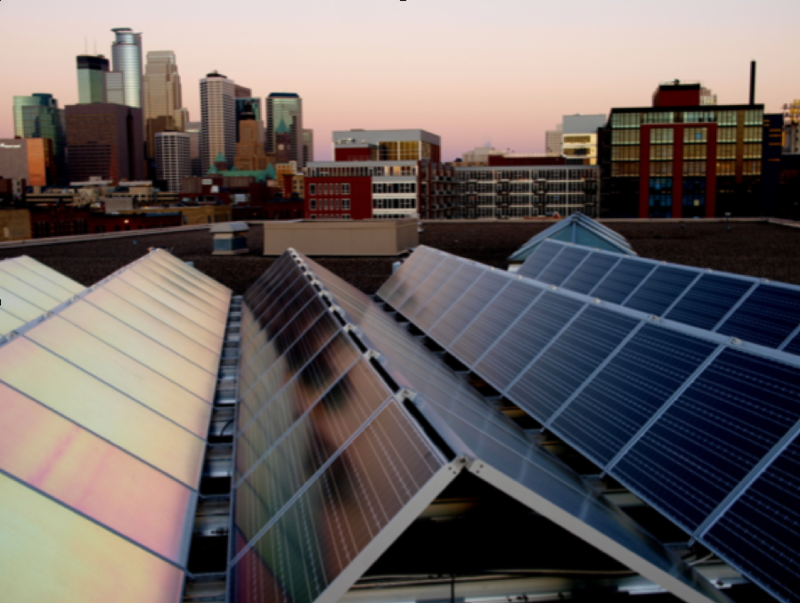 They have begun to score wins, including a victory in Arizona, where regulators granted the state’s largest utility, APS, the right to impose fees on households with rooftop solar. Since then, rooftop installations have fallen by 40 percent. Arizona is now one of only five states where the number of solar jobs is actually declining. Since 2010, the Waltons have donated $4.5 million to more than 20 organizations, including the American Legislative Exchange Council (ALEC), Americans for Prosperity, and the American Enterprise Institute, which are leading the state campaigns against clean energy. A Walton-owned solar company, First Solar, was instrumental in helping APS win in Arizona, backing the utility even as the rest of the solar industry joined environmental and consumer groups in opposing the new fees. First Solar builds solar arrays for utilities and, as such, stands to benefit if households are blocked from generating their own electricity, even if it means slowing the overall growth of solar. The findings of this report are significant in part because of what’s at stake for our energy system. This report also offers an instructive case study of the complexities of contemporary green-washing. “The Waltons claim to have a deep commitment to sustainability, but their support for anti-solar initiatives tells a different story. The Waltons are investing in efforts that both undercut clean energy and prevent average Americans from benefitting economically from solar power,” said Stacy Mitchell, a senior researcher at ILSR and author of the new report. 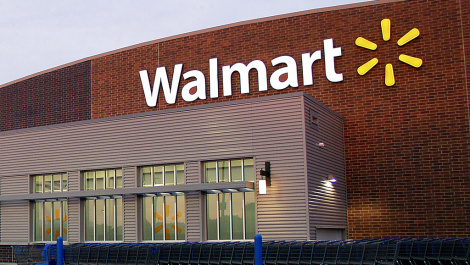 In a report released last year, ILSR found that since the Waltons and their flagship enterprise, Walmart, publicly embraced environmentalism in 2005, Walmart’s self-reported greenhouse gas emissions have grown by 14 percent and the company was generating only 4 percent of its power from wind and solar, despite pledging to go 100 percent renewable. 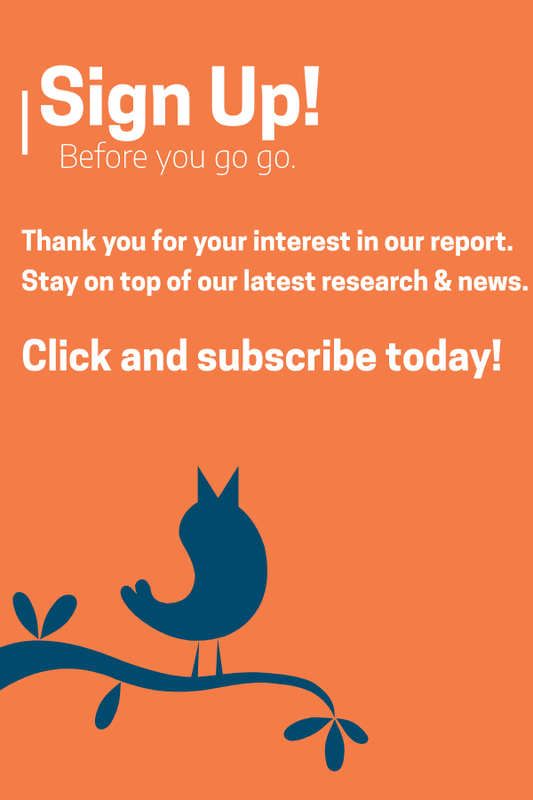 (That share has since dropped to 3 percent.) ILSR’s 2013 report also found that both Walmart’s and the Walton family’s political donations heavily favor lawmakers who oppose legislation to reduce climate pollution. Several leading environmentalists offered perspective on the findings of the new report. “Rooftop solar in the U.S. is growing exponentially and more and more Americans have access to affordable solar power that cuts their energy bills and builds a more sustainable energy future. Yet, the Waltons’ money is instead limiting average Americans’ ability to go solar and control their own energy future,” said Erich Pica, president of Friends of the Earth and an expert on tax and budget policies that spark a transition to clean energy. “Arizona is one of the country’s leaders in solar, with more solar per person than any other state. Just as solar is poised to take off, the Waltons’ funding is restricting our ability to put solar on our homes, businesses, schools, and churches, and the Waltons’ own solar company is actually fighting against the growth of the rooftop solar industry,” said Russell Lowes, founder and research director of SafeEnergyAnalyst.org, which provides technical assistance to Arizona homeowners and businesses moving to renewable energy sources. There is no doubt that the wheels of industry do move in mysterious ways if First Solar is undermining their own future so be it. Walmart is big, so anything they do is by definition big. If you read the full report, you’ll see that compared to companies like IKEA or Kohl’s, Walmart is a laggard in installing solar. A more appropriate measure than total capacity installed is, as we use, capacity divided by total energy use, or retail footprint, or any other “per capita” measure.